This article is about the baseball player. For other people, see Adrián González (disambiguation). This name uses Spanish naming customs: the first or paternal family name is González and the second or maternal family name is Savín. Adrián González Savín (born May 8, 1982), also known by his nicknames A-Gon and Titán, is an American-Mexican professional baseball first baseman who is currently a free agent. He previously played in Major League Baseball (MLB) for the Texas Rangers, San Diego Padres, Boston Red Sox, Los Angeles Dodgers and the New York Mets. González was the first overall pick in the 2000 MLB draft by the Florida Marlins. He was traded to the Rangers, and made his MLB debut with them in 2004. He was traded to the Padres after the 2005 season, where he was an All-Star selection three times and a two-time Gold Glove Award winner. He was traded to the Red Sox after the 2010 season, and was traded to the Dodgers in August 2012. After playing for the Dodgers throughout the 2017 season, he was traded to the Atlanta Braves, but was released without playing for them. He then played for the Mets, who released him during the 2018 season. Adrián González was born in San Diego, California to David and Alba González, both Mexican natives. González is the youngest of three boys; his brothers are David Jr. and Edgar, a former big leaguer. After his birth, his parents moved the family to Tijuana, where his father owned an air-conditioner business. The three boys grew up playing baseball in Mexico, where their father had been a member of the Mexican national baseball team. In 1990 the family returned to the United States, settling in Bonita, California. While Adrián was drafted by the Florida Marlins out of high school, his brother Edgar Gonzalez attended San Diego State University and was selected by the Tampa Bay Rays in the 30th round of the 2000 draft. Edgar debuted in the major leagues as a utility man with the San Diego Padres in 2008, joining his brother as a teammate. In 2012 David and Alba González were named 2012 George and Barbara Bush Little League Parents of the Year. In November 2012, González was honored as one of 30 "exemplary citizens" by the Mayor of Tijuana in an official ceremony. González was projected to be a late first-round pick out of Eastlake High School in Chula Vista, California, however, he advanced with his senior year performance. In his senior year, he hit .645 with 13 home runs and 34 runs batted in. In June 2000, González became the first infield position player to be drafted first overall since Alex Rodriguez in 1993. He was given a $3 million signing bonus by the Florida Marlins. While in the Marlins organization, González played with the Gulf Coast League Marlins, Kane County Cougars, Utica Blue Sox, Portland Sea Dogs (2002), Albuquerque Isotopes (2003), and Carolina Mudcats (2003). With the A level Kane County Cougars in his 2nd professional season, González hit .312 with 17 home runs and 103 RBIs in 127 games. As a result, he was selected by the Midwest League as the Most Valuable Player & Top Prospect in the league. He also played in the All-Star Futures Game. After a wrist injury, the Marlins felt González would be hindered swinging the bat, so the Marlins included González in a June 2003 trade with the Texas Rangers, along with Ryan Snare and minor leaguer Will Smith, to acquire a relief pitcher, Ugueth Urbina, to aid their championship drive. González played with the Rangers' Class AA team, the Frisco RoughRiders until he made his Major League debut against the Seattle Mariners on April 18, 2004. He was hitless in 3 at-bats. He recorded his first base hit on April 20 against Ramón Ortiz of the Anaheim Angels and his first home run on April 25 off Kevin Jarvis of the Seattle Mariners. He played in 16 games for Texas in 2004 and in 43 games in 2005, with a combined batting average of .229 and 7 homers. After the season, González was traded to the San Diego Padres along with pitcher Chris Young and outfielder Terrmel Sledge. In return, the Rangers received Adam Eaton and Akinori Otsuka. Originally seen as an eventual replacement for Ryan Klesko at first base, González was given the job when Klesko underwent shoulder surgery. With extended playing time at first base in 2006, González continued to improve his hitting and defense. On July 23, 2006, he was named the NL Player of the Week. In his first full season, he led the Padres in batting average (.304) and home runs (24). He was the first player in Petco Park history to have more than one multiple home run game. He was named the Padres' MVP for 2006. On March 31, 2007, González agreed to a $9.5 million, four-year deal, with a club option for $5.5 million in 2011. In the 2007 season, he led the Padres in home runs again, with 30, and had a team-high 100 RBIs. He led all Major League first basemen with 161 games and a career-high 46 doubles. In the 2008 season, González finished with a .279 average and once again led the Padres with 36 HRs and 119 RBIs. He was elected to the 2008 MLB All-Star Game as a reserve. He went 1 for 3 with a single and a sacrifice fly, scoring Miguel Tejada of the Houston Astros. He won his first Gold Glove Award in 2008 at first base. González set career highs in games played (162), home runs (36), RBI (119), runs scored (103), walks (74) and slugging percentage (.510). He was named the Padres MVP for the second time. González played winter ball in the Mexican Pacific League with the Venados de Mazatlán. In the 2009 Caribbean Series, he led his team past the Dominican Republic's Tigres del Licey with a record-setting 3 home runs on February 4. González hit 23 homers and led Major League Baseball in that category at the end of May 2009. This despite playing his home games at Petco Park, which Padres statisticians describe as an "extreme pitcher's park." On May 18, González was described as being one of the two most underrated players in the National League according to a poll of Major League executives and managers conducted by MLB.com. On April 1, González was named the NL Co-Player of the Week for the second time in his career. During that week, González hit four home runs, tallied 10 RBIs, and had a 1.000 slugging percentage. González was elected to the 2009 Major League Baseball All-Star Game after voting by fellow players, managers and coaches. He subsequently participated in that year's Home Run Derby where he hit two home runs in the first round. On August 1, González finished 6-for-6 with three RBI as the Padres topped the Milwaukee Brewers 13–6. González's six hits are the most by any Padre in a nine-inning game. Three others have accomplished the feat, but did it in extra-inning contests. González hit five singles and a double. González started the 2010 season playing well. On May 24, he was named the NL Player of the Week for the fourth time in his career. On June 2, González hit a walk-off grand slam in extra innings to lead his team toward a 5–1 victory over the New York Mets. In July, González was elected to participate in his third consecutive All-Star game. During the 2010 season, González had 176 hits in 591 at-bats, good for a .298 batting average, his highest since hitting .304 in his first season with San Diego (2006). He had 93 walks and 114 strikeouts. His 93 walks put him in third place in the NL behind only Prince Fielder (114) and Albert Pujols (103). He finished with 31 home runs and 101 RBI, the third time in his career he had 100 RBI or more. González played in 160 games on the year, tying him with Rickie Weeks for 5th in the NL. He scored 87 runs on the season, compiling 302 total bases, which also tied him with Weeks, for 6th in the NL. González was named team MVP for the third consecutive year and the fourth time overall with the Padres. On December 6, 2010, González was traded to the Boston Red Sox for a package of right-handed pitcher Casey Kelly, first baseman Anthony Rizzo, outfielder Reymond Fuentes, and a player to be named later, later determined to be Eric Patterson. On April 15, 2011, González and the Red Sox agreed to a seven-year contract extension worth $154 million through the 2018 season. On June 19, 2011, González hit his 1,000th career hit: a triple off of Milwaukee Brewers pitcher Yovani Gallardo. On July 3, 2011, González was selected to represent the Red Sox at the 2011 All Star game in Arizona along with teammates Josh Beckett, Jacoby Ellsbury, David Ortiz, Kevin Youkilis, and Jon Lester. González hit a home run in the game and was responsible for the only run for the American League. Additionally, Ortiz selected González as one of three sluggers to join him in the Home Run Derby, where he finished second to Robinson Canó. González tied a record for most home runs in the final round of the home run derby at 11, which was then surpassed by the victor Cano. González was named AL Player of the Month for June 2011 with a .401 average (40 for 99) – the best in the Majors for that month. After placing second in the 2011 Home Run Derby, González faced a home-run slump until he hit five home runs in ten at-bats on August 23–25. He appeared on the cover of baseball video game MLB 12: The Show. On November 21, the AL MVP ballots came out, with González in seventh place and his teammate Ellsbury in 2nd, both losing to Detroit Tigers ace Justin Verlander. In 2012, González appeared in 123 games with the Red Sox, hitting .300 with 15 homers and 86 RBI. On August 25, 2012, González was traded to the Los Angeles Dodgers (along with Josh Beckett, Nick Punto and Carl Crawford) and $11 million in cash for James Loney, Iván DeJesús Jr., Allen Webster and two players to be named later (Jerry Sands and Rubby De La Rosa). In his first at bat with the Dodgers that same day, he hit a three-run home run against the Miami Marlins. In 36 games with the Dodgers, he hit .297 with 3 homers and 22 RBI. In the 2013 season, González appeared in 157 games for the Dodgers and hit .293 with 22 home runs and 100 RBI. He was a candidate for the final vote at the 2013 Major League Baseball All-Star Game but did not get selected to the game. In the 2013 NLCS Game 5 against the St. Louis Cardinals, González went 3 for 4 with 2 home runs. The Dodgers would eventually lose the series in six games. González finished the 2014 season with 116 RBI, the most in all of Major League Baseball. He was the Dodgers' nominee for the Hank Aaron Award, after hitting 27 home runs in 159 games. However, his batting average of .276 was the lowest of his career. He finished up the season by winning the Silver Slugger Award as the best hitting first baseman in the NL and also won several awards for his defense at first base, including the Gold Glove Award, Fielding Bible Award and Wilson Defensive Player of the Year Award. González opened the 2015 season with five home runs in the first three games of the season, including three on April 8 against Andrew Cashner. He was the first MLB player to hit five home runs in the first three games of the season. By homering in his fifth consecutive game, dating back to the end of the 2014 season, he tied the team record, which he shares with Roy Campanella (1950), Shawn Green (2001), Matt Kemp (2010), and Joc Pederson (2015). He won the player of the week honors as a result of that performance. He was also awarded with the National League player of the month award for April as he hit .383 with eight home runs and 19 RBI in the month. He recorded his 1,000th career RBI when he hit a two run home run off Julio Teherán of the Atlanta Braves on May 26. 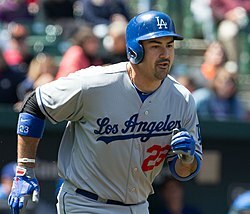 Gonzalez was selected to the 2015 Major League Baseball All-Star Game, the first Dodger first baseman selected since Nomar Garciaparra in 2006. He finished the 2015 season by hitting .275 in 156 games with 28 home runs and 90 RBI, the lowest RBI total he had since 2006. González played for the Mexico national baseball team in the World Baseball Classic qualifiers during spring training in March 2016. The team was managed by his brother Edgar. On June 22, 2016 during a game against the Washington Nationals, Gonzalez made a highlight-reel catch after a ball in foul territory deflected off Chase Utley's glove and off Gonzalez's leg. On August 7, 2016 González hit his 300th career home run against the Boston Red Sox. On the season he appeared in 156 games, with a .285 batting average, 18 homers and 90 RBI. It was the fewest home runs he had hit in a season since 2012. On May 5, 2017, González was placed on the 10-day disabled list due to right elbow soreness. It was the first time in his MLB career that Gonzalez was put on the DL. González recorded his 2,000th career hit with a double off Johnny Barbato of the Pittsburgh Pirates on August 22. González dealt with lingering back issues during the 2017 season, which caused him to spend half the season on the disabled list and as a result lost playing time to rookie Cody Bellinger at first. For the 2017 season, González only appeared in 71 games, batting .242/.287/.355 with 30 RBIs. He was shut down for the season in September and did not appear on the Dodgers playoff roster. In his final at-bat with the Dodgers, Gonzalez hit a home run against the Padres, giving him the rare distinction of having homered in both his first and last at-bats with the team. On December 16, 2017, the Dodgers traded González, Charlie Culberson, Scott Kazmir, Brandon McCarthy, and cash considerations to the Atlanta Braves for Matt Kemp. Immediately following the trade, the Braves designated González for assignment and then released him two days later. González had to waive his no-trade clause to facilitate the trade, and he said that he did so because he wanted to test the free agent waters and see what other opportunities were out there for him. On January 18, 2018, González signed a one-year contract with the New York Mets. On June 10, 2018, the Mets granted González his unconditional release. In 54 games with the Mets, he batted .237/.299/.373; he had just three hits in his final 27 at bats with the team. González and his wife Betsy reside in the San Diego County community of La Jolla. They have two daughters. The couple created The Adrián and Betsy González Foundation, which is focused on empowering underprivileged youth in areas of athletics, education and health. As one of his charitable endeavors, González paid for the refurbishing of the baseball field in the Tijuana sports complex where he played as a youth. González is a Christian and engraved on his bats is "PS 27:1" for verse 1 from Psalm 27. González has spoken about his faith saying, "I don't want to be remembered in baseball. I want to be remembered as a good witness for Christ. ... I'm just trying to use this platform to bring people to Christ." ^ Charles P. Pierce (July 31, 2011). "Gonzo finds a home". Boston Globe. Retrieved July 29, 2011. ^ a b c d e Hernandez, Dylan (February 7, 2013). "Adrian Gonzalez brings his bicultural background to Dodgers' table". Los Angeles Times. Retrieved December 16, 2014. ^ a b "The Parents of LA Dodgers' First Baseman Adrian Gonzalez are 2012 George and Barbara Bush Little League Parents of the Year". Little League Baseball. August 23, 2012. Retrieved December 16, 2014. ^ a b c d Brock, Corey (August 4, 2008). "A dream fulfilled for Gonzalez brothers". MLB.com. Retrieved December 16, 2014. ^ Edes, Gordon (February 10, 2011). "Gonzalez began with pocket of quarters". ESPNBoston.com. Archived from the original on February 14, 2011. Retrieved February 14, 2011. ^ "Marlins select infielder Gonzalez with No. 1 pick". Topeka Capital-Journal. Associated Press. June 6, 2000. Retrieved December 28, 2017. ^ Blasco, J. In the Spotlight – Adrian Gonzalez. Accessed November 2, 2010. ^ Kevin Thomas (April 20, 2011). "On Baseball: Gonzalez recalls time in Portland". Portland Press Herald. Retrieved June 16, 2013. ^ "Ring-bearer: How an Adrian Gonzalez deal led to a championship". WEEI-FM. March 12, 2011. Retrieved April 9, 2015. ^ a b c d "Player Bio Information". MLB.com. Retrieved February 2, 2011. ^ "Gonzalez agrees to 4-year deal with Padres". ESPN. Associated Press. April 1, 2007. Retrieved February 6, 2009. ^ Jesse Sanchez (February 5, 2009). "Gonzalez powers Mexico past DR". MLB. Archived from the original on February 6, 2009. Retrieved February 5, 2009. ^ a b Brock, Corey (May 18, 2009). "Werth, Gonzalez NL's most underrated". MLB.com. Retrieved June 21, 2010. ^ "Philadelphia's Ryan Howard, San Diego's Adrian Gonzalez named National League Co-Players of the Week presented by Bank of America". MLB.com. June 1, 2009. Retrieved June 21, 2010. ^ Brock, Corey (July 5, 2009). "Padres' Bell earns first All-Star Game trip". MLB.com. Retrieved June 21, 2010. ^ "MLB Player Batting Stats – 2009". ESPN. Retrieved June 21, 2010. ^ "Adrian Gonzalez's walk-off grand slam lifts Padres over Mets". USA Today. June 3, 2010. ^ Brock, Corey (January 26, 2011). "Bell, Adrian honored at Padres' awards dinner". MLB. Archived from the original on February 2, 2011. Retrieved February 2, 2011. ^ Browne, Ian (April 15, 2010). "Red Sox, Adrian González agree on seven-year contract". MLB.com. Retrieved April 15, 2010. ^ "Adrian Gonzalez legs out 1,000th career hit". ^ Drellich, Evan (July 5, 2011). "Gonzalez named AL Player of the Month". MLB. Retrieved July 6, 2011. The leader in two of the three legs of the American League triple crown and a true force in the middle of the Red Sox lineup, first baseman Adrian Gonzalez on Tuesday was named the Budweiser Presents American League Player of the Month for June. ^ Jackson, Scott. "Yo Adrian! You're on the cover of MLB the Show". Retrieved November 10, 2011. ^ Mark Saxon (August 26, 2012). "Gonzalez, Crawford, Beckett to L.A." ESPN. Retrieved June 14, 2013. ^ Chuck Schilken (August 25, 2012). "Adrian Gonzalez homers in his first at-bat with Dodgers". Los Angeles Times. Retrieved February 12, 2015. ^ "Gonzalez homers 3 times to lead Dodgers past Padres 7–4". ESPN. Associated Press. April 9, 2015. Retrieved April 9, 2015. ^ Stephen, Eric (April 13, 2015). "Adrian Gonzalez named NL Player of the Week". truebluela. Retrieved April 13, 2015. ^ Stephen, Eric (May 4, 2015). "Adrian Gonzalez named NL Player of the Month for April". truebluela.com. Retrieved May 4, 2015. ^ Stephen, Eric (May 26, 2015). "Adrian Gonzalez joins 1,000-RBI club". SB Nation. Retrieved May 26, 2015. ^ "Adrian Gonzalez Statistics & History". Baseball Reference. ^ "Gonzalez's crazy circus catch". Major League Baseball. Retrieved June 23, 2016. ^ Baer, Jack (August 8, 2016). "A-Gon stings Red Sox to join 300-HR club". mlb.com. Retrieved August 8, 2016. ^ "Adrian Gonzalez placed on DL for first time". MLB. Retrieved May 5, 2017. ^ Gurnick, Ken (August 22, 2017). "A-Gon's double career hit No. 2,000". mlb.com. Retrieved August 22, 2017. ^ Crasnick, Jerry (August 26, 2017). "Granderson, Gonzalez add something old and new to Dodgers". ESPN. Retrieved August 26, 2017. ^ Stephen, Eric (September 27, 2017). "Adrian Gonzalez shut down for rest of season". SB Nation. Retrieved October 29, 2017. ^ "San Diego Padres at Los Angeles Dodgers Box Score, September 26, 2017". Baseball Reference. Retrieved December 17, 2017. ^ Bowman, Mark (December 16, 2017). "Braves land 4 for Kemp; Acuna's path cleared". MLB.com. Retrieved December 17, 2017. ^ Adams, Steve (December 18, 2017). "Braves Release Adrian Gonzalez". MLB Trade Rumors. Retrieved December 18, 2017. ^ Stephen, Eric (December 16, 2017). "Adrian Gonzalez says goodbye to Dodgers, will be a free agent after waiving no-trade clause". SB Nation. Retrieved December 17, 2017. ^ Rosenstein, Mike (January 18, 2018). "MLB free agency: Mets officially sign Adrian Gonzalez". NJ.com. Retrieved January 18, 2018. ^ Kolur, Nihal (June 11, 2018). "Mets release first baseman Adrian Gonzalez". Sports Illustrated. Retrieved June 11, 2018. ^ "Adrian Gonzalez: Biography and Career Highlights". Mlb.mlb.com. Retrieved October 19, 2011. ^ Cervanka, Ron (December 3, 2014). "Adrian Gonzalez to be honored in Mexico City". Think Blue. WordPress. Retrieved April 28, 2015. ^ "The Adrian and Betsy Gonzalez Foundation". Adriangonzalezfoundation.org. Retrieved October 19, 2011. ^ "Adrian Gonzalez' bat sends a message (in more ways than one)". WEEI-FM. May 17, 2011. Retrieved April 9, 2015. ^ "IN FULL SWING". Archived from the original on February 22, 2014.